New app claims its neuroscience-based music will increase your attention span by up to 400 percent. Photo courtesy of Shutterstock. We are told the average attention span has plummeted from 12 seconds in 2000 to eight seconds in 2013, while that of a gold fish remains strong at 9 seconds. Yet, the ability to focus is crucial to accomplishing most tasks. (Still reading?) Most everyone, then, would naturally be interested in a new app, Focus@will, which claims its neuroscience-based music will increase your attention span by up to 400 percent. While Wired magazine analyzes the possibility of this app delivering on its grand promise, my own version of a snap judgment is much less demanding and requires, well, a shorter attention span. But you can decide for yourself. “Do you like to listen to music while you work?” the website shouts from its landing page. 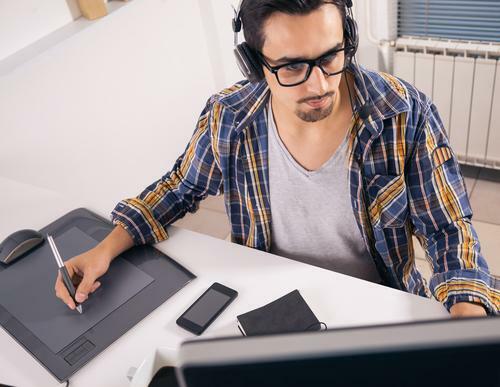 According to the company, which was founded by musicians, about half of us do like to work with tunes playing in the background, but that’s not a great idea since mainstream music is designed to connect with you intellectually and emotionally. Instead of reducing distraction and raising your comprehension, most music essentially does the opposite. Comparatively, Focus@will delivers "attention amplifying" music intended to “engage with your brain's limbic system,” according to the website. The app makes it easier for a listener to “get into the concentration flow, and then keeps you there.” Licensed music selections were chosen because they lacked vocals, saxophones, or other things the company has found distracting through its tests. Developed in partnership with two neuroscientists, the company claims use of the app typically results in a 12 to 15 percent positive increase in "focus biomarker" and up to 400 percent extended session time. Subscribers can have unlimited access for $3.99 per month. Among the reasons Wired writer Christian Jarrett colors himself “skeptical" is a lack of data on the product. If you scan through the scientific literature provided by the company, “you’ll find a wide assortment of scientific references, some decades old, others more recent,” Jarrett writes. “Crucially, not one of them is a trial for the benefits of the Focus@will app.” Another reason for incredulity is his belief that individuals never respond uniformly to different types of music and, depending on the task, may require singular types of non-distracting background noise. Essentially, he is asking, Isn’t the app too one size fits all? Kudos for a thoughtful assessment, but I believe my own test for judging this app is much more efficient. Go to the free trial page. Any online music product that can’t supply me with a free 10-minute demonstration without first sucking information out of me probably isn’t worth it (in my most humble opinion). From past experience, companies requiring me to sign in just for dropping by are compiling email lists, which they intend to sell for a profit of which I will not be partaking... so sorry, guys. I’m easy, but not that easy. I’d have no problem supplying my information to a company offering a product I actually had a chance to look over and wanted to use, but to have to ante up before I’ve even been allowed a test run… well, I just don’t need to be plagued for eternity with emails from who-knows-where just for looking in the window. I don’t have the attention span for that.